Love using coconut oil in so many things, can’t wait to try the Rawk Candy Cup recipe. I use coconut oil for just about everything! It’s hard to pin down just one favorite. But if I had to, it would be grilled cheese sandwiches using coconut oil instead of butter. We call it a ‘happy grilled cheese’! I use coconut oil mainly as a moisturizer. I’ve been using coconut oil lately in a homemade toothpaste recipe…love it! It’s easier to say what I don’t use it for! 🙂 I use it as the only thing I put on my face or body. I use it in all of my baking and cooking. I use give it to my dogs and cats. I love coconut oil!! I use coconut oil as an all over skin conditioner. I use a dab when Im baking pork chops instead of butter or margarine. they come out so juicy and fall apart tender, My family loves it. I use it for lots of other things too like my body scrubs and facials. I put coconut oil in my coffee, cook with it, and use it on my hair. I just found an “ice cream” recipe yesterday using coconut oil and coconut milk… I’m looking forward to trying it very very soon. I use coconut oil for everything! Currently loving it on potatoes!! I like to make my own face and body moisturizer! I use coconut oil for baking and for lip gloss. I LOVE to cook with coconut oil! It’s my very favorite oil to use! To replace hydrogenated shortening in pie crusts…works great! I use coconut oil for just about everything. Got rid of unhealthy oils. Even use coconut oil spray. It’s delish. I like to use coconut oil to fry eggs. I like to use put it in my hair deep conditioner. Hello my name is Lisa, my daughter in Gluten intolerant and I’m find out that I am too. We started using coconut oil for everything in our house replacing other oils, using in it my protein smoothies. and all kinds of other things. We love coconut oil and would love to try this brand. I like to use coconut oil in cooking & baking, as well as for skin care, hair care, and oral care. I love to use it to saute veggies and to use instead of butter on toast, etc. I love coconut oil for so many things! I use it for cooking and for skin care. But I love mixing some up in a cup of tea for my daily dose. I love to put it in my oatmeal! I use it for baking cookies! My favorite use is sauteing onions – YUM! My favourite use for coconut oil is for my skin! I love it. I use it on my skin. I also cook and bake with it. My family loves it on popcorn too. I’ve been baking with coconut oil a lot; I make these wonderful whole wheat muffins with almonds and cranberries and honey and coconut oil. Email me if you want the recipe, though I’m not sure that it goes with a raw diet. I love coconut oil! My favorite use is to mix it with cocoa powder and make chocolately goodness! I also like to fry food in it. I use it in place of those evil vegetable oils. 😉 I love it as a skin moisturizer. I love coconut oil in oatmeal! The random winner of a Tropical Traditions Quart of Coconut Oil is: Vicki Ponichtera! (Vicki, I have sent your email address to Tropical Traditions, and they will be contacting you soon to get your shipping address). Betty, those cups look delicious! 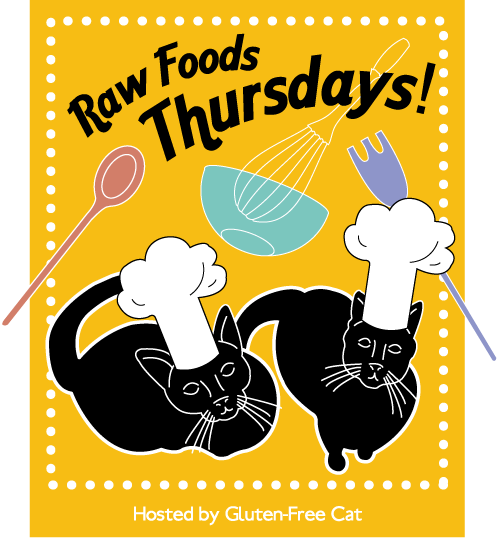 I’m featuring them at Raw Foods Thursdays tomorrow. Thanks so much for sharing them with us!